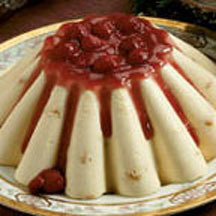 An elegant and festive eggnog cream mold laced with crumbled macaroon cookies and served with a simple raspberry sauce. For Eggnog Macaroon Cream: Soften gelatin in 1 cup eggnog; stir over low heat until dissolved. Add sugar; stir until dissolved. Blend in remaining eggnog, sour cream and extract. Chill until thickened but not set. Fold whipped cream and cookies into eggnog mixture. Pour into lightly oiled 2-quart mold or 8 individual molds; chill until firm. Unmold and serve with Raspberry Sauce. For Raspberry Sauce: Drain raspberries, reserving syrup. Combine juice and cornstarch in saucepan. Bring to boil over medium heat, stirring constantly. Boil 1 minute or until thickened, stirring constantly. Cool. Stir in raspberries; chill.